This quirky little children’s book captured my interest right away because I’m in the midst of teaching phonetic skills to second and third graders. 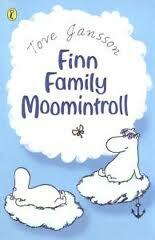 There couldn’t be a better book for that than Moomintroll. It is filled with odd little words that you can read only if you apply the basic phonetic rules to them. So I love using this book for instruction purposes. But it was written as simple entertainment. Originally published in Finland, it is a book almost about nothing, actually. There’s no real drama, no big events, just little unusual things that happen (all because of the Hobgoblin’s hat.) But for young children who love the fanciful worlds of hobgoblins, talking mice, nondescript animals, this children’s book is perfect. The little adventures are silly and magical. The characters are just weird enough to be puzzling without any bad traits. The family is a perfect model of the open family life we think might exist elsewhere… where everyone is welcomed into the family, treated equally, and loved. The book was read out loud to a third grade class at the Waldorf Charter school where I teach, and one of the students from that class remembered the details many months afterwards. So the book clearly has an impact on children. As a reading specialist, one treasure that this book brings is the use of nonsense words. Two characters, Thingumy and Bob, speak a language that no one understands. They say things such as “Anyway, I can fell smood.” Can you guess what that means? Try exchanging the initial consonant sounds… This is the perfect tool for teaching children the phonetic rules using nonsense words, then rearranging the letters to make real words. I’m thrilled to have it available. And if you are not a teacher, then just enjoy the simple sound of language and make-believe. Great for 5 to 9-year-olds.